In the early 17th Century, the Lower German Palatinate was rich with Protestant refugees from surrounding lands. Families settled there to rebuild their lives and escape persecution. The Palatinate was repeatedly ravaged by attacks from France during the 17th Century. Having had enough, and responding to pamphlets designed by New World proprietors to tout the benefits of emigrating to America, a substantial exodus of Palatine families occurred in 1709, just following a terribly severe winter. A few of the Palatine emigrants of 1709 found their way to the New World directly, but over 13,000 were transported to London. (For more detail on the 1709 Palatine emigration, see Lester Hartrick's detailed article on the subject, and Early Eigteenth Century Palatine Emigration (a complete book on the subject by Walter Knittle, 1937). The wealthy proprietors of Irish estates desired to increase the Protestant tenant population at the expense of the Catholic Irish, a goal supported by Queen Anne. In September 1709, almost 3000 Palatines were relocated to rural Ireland, with a roughly equivalent number being transported to New York and North Carolina. Over the subsequent three years, over two thirds of the Irish Palatine settlers, unwilling to pay rent for the land, incensed by ill usage by landlords and harrassed by Catholic Irish neighbors, left Ireland and returned to England and Germany. 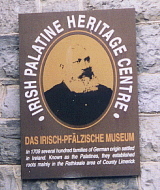 Over the next few years, some further Palatine immigrants joined the families in Ireland, but by August 1712, only 254 of the original 821 families had settled in Ireland, many of the rest having returned to England to settle there or more often to book passage to America or home to Germany. Of the land proprietors who successfully managed to induce their allotment of Palatine immigrants to remain in rural Ireland, the most successful was Sir Thomas Southwell of Castle Matrix near Rathkeale, Co. Limerick. He championed the Palatines to secure government support for the settlement venture and took care of many of their initial needs at considerable personal expense, reimbursed only just before his death in 1720. In 1711, Southwell had retained only 10 families (including the Teskeys), but by 1714 he had settled about 130 families in his lands, and the region around his domain has retained the largest concentration of Irish Palatine residents to this day (e.g. in Rathkeale, Killeheen, Ballingrane, and Courtmatrix/Court Matrass). Several Teskeys still live and farm in the area. The Palatines retained many of their Germanic customs and protestant religion over four generations and seldom married outside the Palatine community. The Teskeys intermarried primarily with just a handful of other Palatine families (Switzer, Bowen, Sparling, Delmege, Ruttle/Ruckel, Shier/Shire, Lodowick, Legear, Sparling, Miller and a few others), and men who had migrated to other secondary settlements often returned to the core Palatine settlements of the Southwell Estate to marry. Apparently having reconciled their native Lutheranism with the Anglican religion expected of them by their proprietors, the Irish Palatines suffered from the lack of a local religious leader. This, together with their tradition of burying the family bibles with the deceased, caused them to begin losing touch with their religious traditions. When John Wesley visited the area on more than one occasion, many of the Palatines turned gladly to Methodism, and two of their early Methodist leaders in Ballingrane, Philip Embury and Barbara Ruttle Heck, played an important role in introducing Methodism to North America. Starting around 1740-60, Irish landlords began to drastically increase the rents charged to the Palatines as their original leases expired. This caused a wave of relocation to secondary colonies where certain landlords were willing to offer more favorable terms (see below). It also caused the beginnings of further emigration of some Palatines from Ireland. Some areas of Palatine Secondary Settlement are shown in the following table. 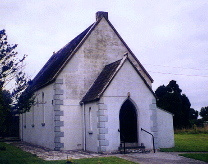 Teskeys are known to have re-settled in the areas of Kilnaughtin, Co. Kerry, and Rineroe, Adare, Co. Limerick. By this time, no trace of original Palatine colonies remained in other areas such as Palatinestown, Co. Carlow (Ram Estate), and in the area of Gorey and Old Ross, Co. Wexford. The Irish Famine of nearly a century later had less effect on the Palatines than on their Irish neighbors, due to the Palatines' advanced farming practices and variety of crops. Nonetheless many Palatines did suffer hardship due to the Famine and due to a population that had outgrown the modest acreage of their settlements. They began to emigrate from Ireland at this time, continuing to do so for years thereafter, resulting in a gradual but steady decline in the Irish Palatine population. Members of the Teskey clan emigrated to England, the northeastern United States and --most notably for its large concentration of Teskeys-- Canada. Just as Jacob Teske of the Palatinate and his sons gave rise to the Teskeys of Ireland, some Teske families have emigrated directly from Germany to other English-speaking countries at various times and again changed the spelling of their name to Teskey or Tesky. Most known Teskeys, however, appear to be descended from the Irish Palatines. 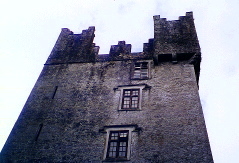 Further detailed historical and genealogical information concerning the Irish Palatines can be found, respectively, in Patrick J. O'Connor, People Make Places - The Story of the Irish Palatines, Oireacht na Mumhan: Newcastle West, Ireland, 1989; and Henry Z. Jones, Jr., The Palatine Families of Ireland, 2nd. Ed., Picton Press: Camden, Maine, 1990. These books can be obtained through the Irish Palatine Association in Rathkeale, Co. Limerick, Eire. Also see at Lester Hartrick's web site his detailed articles on the Palatine emigration and history of the Hartrick clan in Ireland, as well as excerpts from Kathleen Bryant's book Over the Hills and Far Away: Tracing the Sparlings at Mike Barkman's website.